The following is the preferred alternative to a burrow with a plywood roof. For each burrow you will need two or three of the Rounded Rake roof tiles shown below, a pile of unwashed, rock-free “reject” soil. It will have clay particles and when the soil is packed firmly will help the covering soil hold water when it rains and will hold its shape when the tortoise digs beyond the tiles. Also you will need to cut heavy, flexible plastic strips 111/2 in. x 3 in. These burrows can be installed in a few minutes and provide the snug fit needed for two to three years. Dig a downward sloping trench in firm soil of the yard only as wide as the tiles. The firmness will hold the tiles. Dig at least another tile length beyond the end of the tiles. Fill the trench with reject soil, replace tiles together tightly and using a broom handle press down and compact the soil inside for the entire length of the tiles leaving just enough room for the tortoise. You may have to remove the tiles and add more soil and repeat the action with the boom handle till there is the right amount of soil inside. See the diagram, below. Place a plastic strip over each seam between the tiles. Cover the strips with some soil to hold them in place. Cover the tiles with at least 18 – 24 in. of soil and pack it down. See that this soil is available at the end of the tiles for the tortoise to dig downward to lengthen the burrow and create a turn-around. For the first couple of years, as the tortoise grows, it can excavate the soil from inside for a better fit. Make several of these throughout the yard. 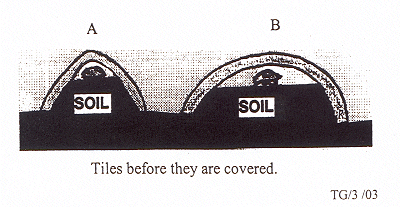 You can see by the diagram that the preferred tile shape (A) the Rounded Rake roof tile creates the important snug fit for the smallest tortoise. Tiles with the wider arc (B) do not create the same snugness and may not be accepted by the tortoise. Also, they tend to collapse on the tortoises as the tortoise enlarges the channel. When the juvenile outgrows the tiles you can build the burrow with a wood roof. See the Tortoise Group Booklet, Desert Tortoises Adoption and Care.